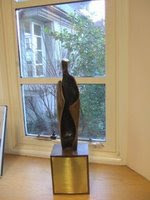 The 2009 Senior Poetry Prize, in memory of Old Columban Peter Dix (the trophy is seen left, in the Library), has been launched. All candidates should submit their portfolio of poems of between two and five poems to Mr Canning by the last day of this term. The two set themes this year are People and Place, and pupils may treat either of these themes in any way. The full rubric can be seen here. Last year's joint winners were Rachel Acton Filion and Fiona Boyd; some of their winning poems can be seen here and here. In 2007 Ben Russell was the winner. Of course, we'll be posting lots of entries here when the judging has been completed at the start of next term.